I knew that documentation and I've already studied it. 4. how to redirect the red, green and blue pixel values (which when using VGA666 appear parallelly on GPIO4-GPIO21) to a set of six other GPIO pins on which they would be output following each other. 1 - AIUI they are just modified versions of hdmi_group/hdmi_mode that are used if you use a dpi_screen. See http://elinux.org/RPiconfig for a list of values for hdmi_group/mode. Most likely you'll be wanting group 2, mode 87 to then allow a custom setup via hdmi_timings. 2 - read https://www.raspberrypi.org/documentati ... /README.md, though I'm not sure I understand what you're after. 3 - not possible. I'm guessing you're after I2C on GPIO 2/3. If you're on a Pi 0/1/2 then you may be able to switch to use i2c-0 and GPIOs 0&1, but then you can't use the camera. Do NOT try that on a Pi3 as it will fail. 4 - as 3, not possible. thanks. That means that Red Bears' IoT pHAT (and a lot of other HAT's) unfortunately cannot be used with VGA. Thank you very much for all this usefull topic! Using DPI interfaced lcd, can we swap from DPI to HDMI when we plug in a HDMI screen? Same as when we use composite screen, it switch to HDMI when we plug in HDMI screen. Is it possible with DPI? How would it be achieved? This question is along the lines of what some others are trying to do, but I wonder if it is possible to 240p (instead of 480i) with the composite video port with the Raspi instead of using VGA addon to another adapter? I know you can set HDMI to 240p, and with these settings using composite video out it will "squish" the screen, but it still outputs 480i. Hi, I hope you can help me with this modification. Now, how do I can make a custom mode for dpi_output_format? mortaca wrote: Hi, I hope you can help me with this modification. Sorry dude, but this is not possible! You can't use DPI and GPIO in parallel because DPI is an alternate function of the GPIOs. from the DPI documentation https://www.raspberrypi.org/documentati ... /README.md shows you the available modes. Other modes are not possible! That table know her well, my example is based on it, but in Mode 5 pins 10 and 11 is output green, is not possible to use the GPIO from 4 to 13 in Mode 5 and from 16 to 25 in mode 6? Another combination is use mode 7 changing rgb_order and lose two bits of the blue, but I would not like to lose a couple of bits of colour. mortaca wrote: That table know her well, my example is based on it, but in Mode 5 pins 10 and 11 is output green, is not possible to use the GPIO from 4 to 13 in Mode 5 and from 16 to 25 in mode 6? Ok, the solution to use UART and DPI is to make a modified dpi24.dtbo and change rgb_order to put red instead of green because the human eye is more sensitive to green scale, the problem is I do not understand the dpi_output_format. How is the magic number calculated? I think many people see this and not understand anything. What port on the CM8833-II did you use? Did you use the SCART connector? I have a CM8833 mk1 which only has the SCART connector. but I do not use any breadboard, raspberry pi 2 and lcd connected with 20cm(I think) wires. Could it be that wires are too long ? I dont have shorter to try. What other problems could be ? # For use with the adafruit 5' tft only. your timings (dpi_output_format and hdmi_timings) are wrong. Check the data sheet and use the excel-spreadsheet (from the Page linked) to have it calculated. Actually with lcd documentation is a problem, because I do not understand values in data sheet or those are just in different naming(page 7). 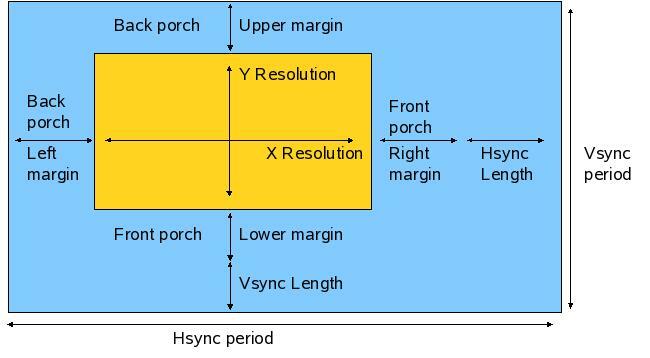 For instance what are actually values for <h_front_porch> <h_sync_pulse> <h_back_porch> and <v_front_porch> <v_sync_pulse> <v_back_porch> ? Refer to 'Fig.3-A Input signal waveform' for the timing details (signal waveform) and Chapter 7 for the related values. These data should be in the display data sheet. HB and VB might be missing. --> vertical back porch = v_back_porch= 5. Vertical front porch can be calculated now. starquake wrote: What port on the CM8833-II did you use? Did you use the SCART connector? I have a CM8833 mk1 which only has the SCART connector. I used the DE-9 Analog RGB connector, and connected the R, G, B, HSync, VSync and Ground pins to the corresponding VGA pins. Using SCART won't be quite the same as it only has a Composite Sync pin - you might get it to work with a circuit to combine the H and V sync into Composite.